Pictured above is Lucas Papademos, the New Prime Minister of Greece. Notice his eyelids are both partially closed, but his left is closed a bit more. This is a fantastic tell of a negative judgement and/or a skeptical opinion. You can almost hear him rendering a negative statement here - and yet it's incredible how often people will speak positivity about a person and/or issue and use this expression. Duplicitous! Now of course, the Prime Minister may very well had making a negative declaration in this moment - and if he was, this facial body language is completely expected. However...if you see another use this facial nonverbal tell - but they speak glowingly - believe their body language, not their words. Watch out! There often is co-existing mid-face tightening seen with this asymmetrical eyelid closure as well, particularly in the "mustache area". Lucas demonstrates that splendidly here. Also be on the lookout for nasal dilation. 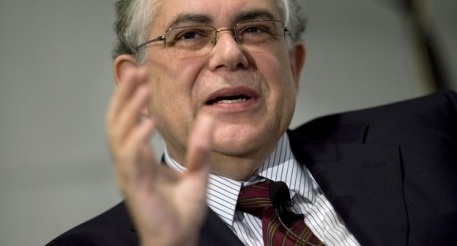 Mr. Papademos' left nostril is brilliantly flared here, indicating coexisting contempt. I wonder to whom he was speaking?